Zero's Neighbour is Hélène Cixous's tribute to the minimalist genius of the artist in exile who courted nothingness in his writing like nobody else: Samuel Beckett. In this unabashedly personal odyssey through a sizeable range of his novels, plays and poems, Cixous celebrates Beckett’s linguistic flair and the poignant, powerful thrust of his stylistic terseness, and passionately declares her love for his unrivalled expression of the meaningless ‘precious little’ of life, its unfathomable banality ending in chaos and death. Poised between a critical essay and a textual performance across two languages adapting Beckett's own literary vein, this book will appeal to scholars, critics and creative writers as well as students of the ‘grey self-Sam’. Its allusive intertextual insights will also prove to be of critical relevance to readers of Dante and Proust, among other literary figures, as much as to those appreciative of Cixous’s own inimitable genius for dissecting the quintessence of the life and works of a ‘neighbourly’ artist. For a final attempt to be done with ending in body and soul with Beckett. "Although a slim book, each page flairs wildly with linguistic play: puns, double entendres, and off-rhymes, a collapsing of Beckett's words with Cixous's, a combinatory style, this is a stage of shadows looming near zero, near nothing or near death or near immortality. Or perhaps closer to the infinite." "A fascinating meditation by one wordsmith on another: Cixous's text reflects not only on Beckett and her relations to his work but also on the very nature of translation itself." "'Precious little,' quotes Cixous from Beckett, finding the precise intersection between her own expansive, luscious prose and Beckett's stark and hilarious minimalism. 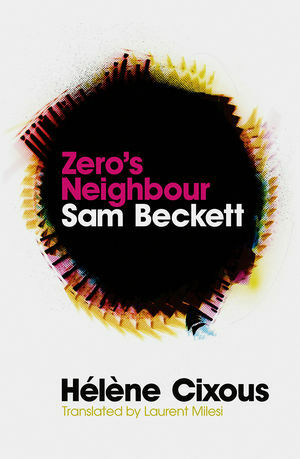 Zero's Neighbour is a fascinating and fantastic confrontation between two very different, equally admirable, proponents of the art of living one's writing out of the certainty of nothing." "This book promises to become as influential in Beckett studies as its author's writings on Joyce proved to be for Joyce studies. A work of poetry as much as of criticism by one great writer on another, this text will be of interest to anyone concerned with questioning the literary experience."